Tomorrowland began as a place for looking into the future that might be. Over the years, though, it has turned from science speculation of rides like Mission to Mars to science fiction like Stitch's Great Escape. This transformation is somewhat understandable when you think that tomorrow has a way of becoming today and making a new tomorrow will cost a lot of money. Faced with this, rides have tended to become either more timeless or presented as interesting historical artifacts (such as with Carousel of Progress. Location: To the east of the Central Plaza. Can be accessed from Main Street, Fantasyland, and Mickey's Toontown Fair as well as the Walt Disney World Railroad. Astro Orbiter Fly a rocket ship high above Tomorrowland. 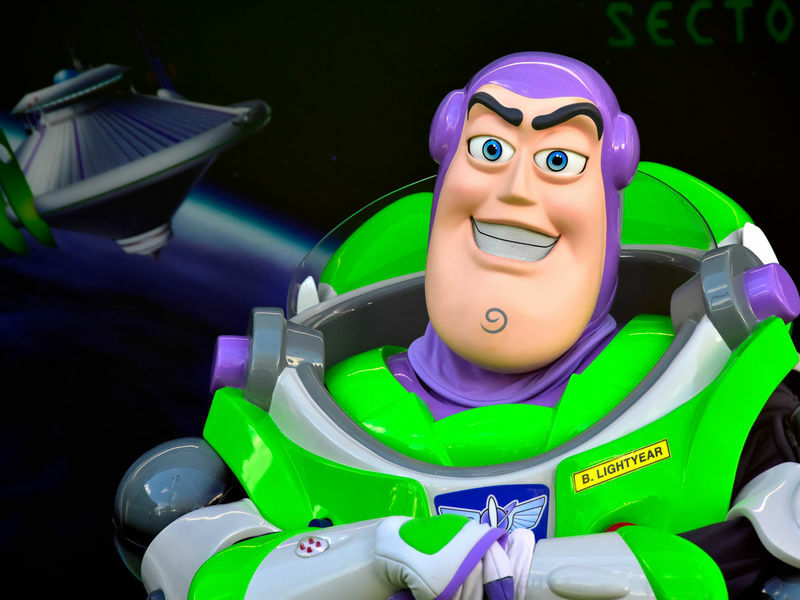 Buzz Lightyear Space Ranger Spin Take part in helping Buzz fight Emperor Zurg. Monsters, Inc., Laugh Floor An interactive comedy show with Mike Wazowski. Space Mountain A roller coaster through the dark depths of space. Stitch's Great Escape It's your job to keep Stitch from escaping�it probably won't go well. 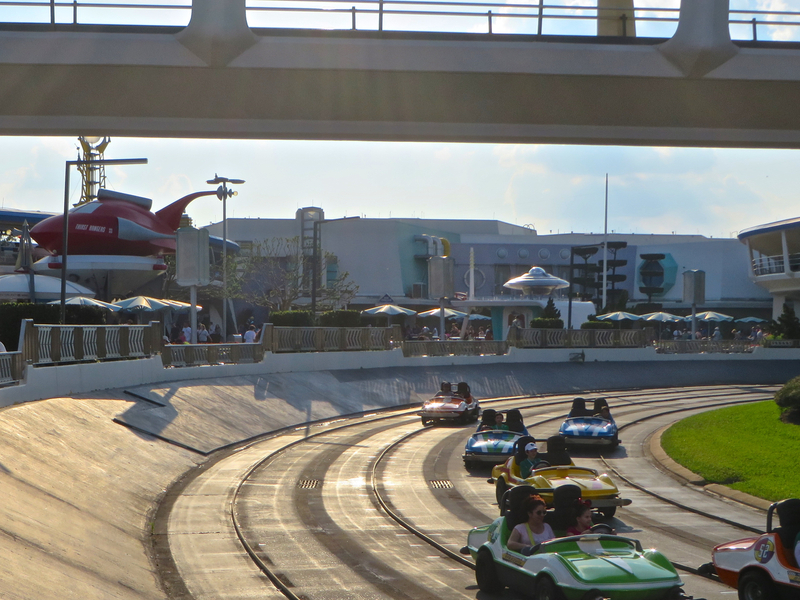 Tomorrowland Speedway Let your child (or your inner child) drive around this race track. Tomorrowland Transit Authority Peoplemover Relax through a tour of Tomorrowland's sites and sounds. Walt Disney's Carousel of Progress An animatronic exploration of a century of technological advancement. Galaxy Palace Theater Rest while watching a dance or musical troupe; also used for special events. Auntie Gravity's Galactic Goodies Ice cream and smoothies. Cosmic Ray's Starlight Cafe Plenty of choices and some "live" entertainment. The Lunching Pad at Rockettower Plaza Gourmet hot dogs and beverages. Tomorrowland Terrace Restaurant Counter-service food between Tomorrowland and Main Street. Merchant of Venus The central location for all things Stitch-related as well as pins and futuristic merchandise. Mickey's Star Traders Space themed Disney toys and clothing. At this location: Tomorrowland was one of the original lands when the park opened in 1971. It expanded slightly when Space Mountain opened in 1975 and then lost a little bit of space to Mickey's Toontown Fair in 1996. The Land's History: Tomorrowland wasn't quite ready for primetime when the Magic Kingdom opened in 1971. The only attractions ready for guests were the already outdated Flight to the Moon, Grand Prix Raceway, and a CircleVision movie called America the Beautiful. Things picked up by 1975 when Star Jets, WEDway PeopleMover, and Space Mountain opened up. 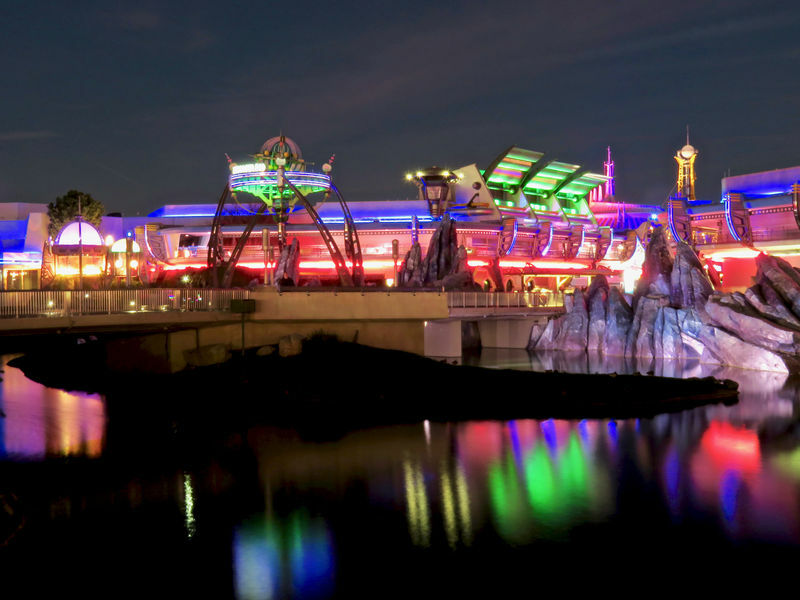 In 1994 the Magic Kingdom got a "New Tomorrowland" in which many rides were replaced or updated and the general look of the area was updated.